I love pizza, and most people I know do also. On average, each American typically consumes 23 pounds of pizza annually. Why not make a pizza shaped garden? In this garden you will grow the vegetables and herbs used to make pizza sauce and toppings. This pizza shaped garden plan takes very little time, tools and effort to plant. The whole family can enjoy planting together while using this project as a resourceful teaching tool to learn about the process of growing, harvesting, and making your own sauce. Before getting started make sure to let your kids know what to expect before you begin. Have a short discussion on the science aspect of gardening such as how root systems work. Inform children about the insects they may encounter when gardening and how many insects are beneficial to plants. Tell them it’s okay to touch a slug, they may feel slimy and won't hurt you. However, do warn children of hurtful insects such as stinging insects and some spiders. The beauty of the pizza garden is the plants require similar growing conditions. Your garden needs to have nutrient rich soil, proper drainage, and at least 6 hours of full sun to flourish. No matter how large you choose to make your garden space, make sure to loosen your garden soil to at least a foot in depth, and you may want to amend it with compost. Once you have chosen a spot for your pizza garden, you will to need create the pizza circle. Mark off the circle by putting a stake upright in the garden area. Tie a three and a half foot piece of string to the stake. Keeping the string tight and walk around in a circle and mark the ground to show the garden's border. Divide the circle into six equal wedges. The “pizza slices” can be defined with rocks, landscaping timbers, or rows of parsley or basil. Below are several suggested types of common herbs and vegetable plants that you may want to consider growing. In this pizza garden plan, grow three kinds of herbs and three vegetables. These suggested plants can be bought locally at your favorite nursery. Oregano: (Origanum vulgare) This aromatic, perennial herb is in the mint family. It is easy to grow and gives pizza the characteristic taste and that wonderful smell. You may use it fresh or dried. I suggest one or two plants. 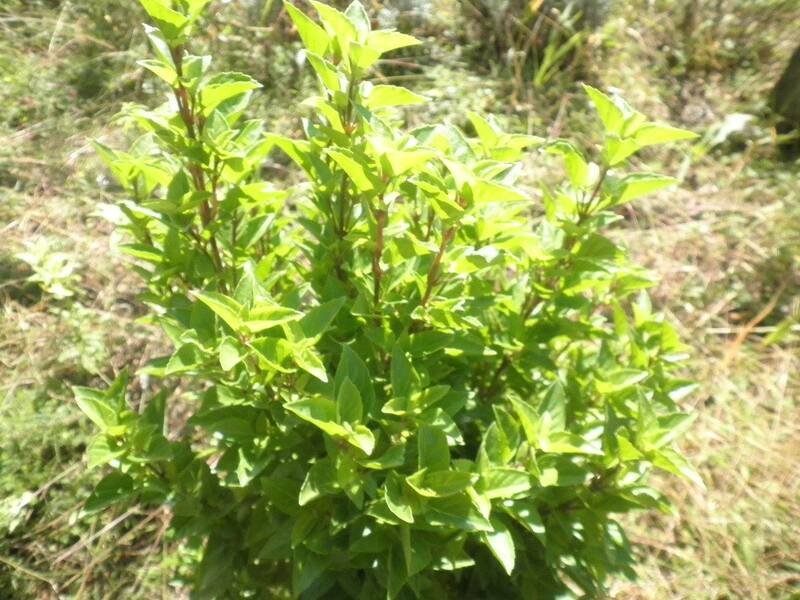 Basil: (Ocimum basilicum) This aromatic herb is a must in the pizza garden. I grow several every year and love it for its wonderful culinary uses. It is good in the sauce and thrown on the pizza in the cheese. Basil is an annual herb and there are many varieties. I recommend the sweet basil variety for your pizza garden. However, there are many varieties of basil and is your personal choice. Two to three plants can be planted in the wedge. This is Greek Columnar basil. We grow this variety because it doesn't flower, so we have basil all season long. Parsley: (petroselinum) This is a biennial herb that reseeds itself. It is very common in Middle Eastern, European and American cooking. Grow two or three plants in the wedge. You may want to define some of your pizza slices with parsley, so you will need several more plants. Tomatoes: (Solanum lycopersicum) The tomatoes I suggest to use on a pizza are the “red sauce” tomatoes, or plum (Roma) tomatoes. I find this tomato an excellent paste-type tomato that gives the tomato sauce a hearty flavor and is easy to grow. If you choose other varieties of tomatoes can be grown and used as well. Here is a bit of tomato trivia. Did you know that in 1893 the Supreme Court ruled that the tomato must be considered a vegetable? Botanically it is a fruit, but vegetables and fruits were subject to different import duties, so it was necessary to define it as one or the other. (Source: The Packer, 6/9/90). A beautiful selection from the garden of Susan Hess. Bell & Hot Peppers: There are two main types of peppers, sweet and hot. The classic sweet green bell pepper is good addition to the pizza garden. Both hot and sweet peppers are a great way to spice up the sauce. I recommend Jalapenos for the hot pepper variety. You may want to plant two or three pepper plants, depending on your taste. 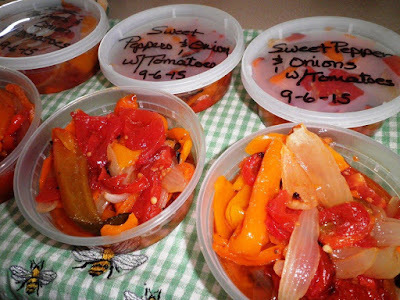 I package peppers, onions, and sometimes tomatoes together, then freeze them so they're always ready. Onions: (Allium cepa) Onions can be planted from sets or transplants. Select red, white, or yellow for your garden. You can plant up to 30 onion sets or transplants in your pizza garden wedge. You ask, what is the difference between a set and a transplant? An onion set is a small bulb up to 1 inch in diameter. An onion transplant is a plant between 8 to 10 weeks old that has not gone through the bulbing process, and if planted at the right time will produce large bulbs. Onions are edible at any stage. Continue to water and weed your garden.You may want to mulch your garden with any organic material such as straw or pine needles that will help keep the weeds from overtaking your garden. 2-3 pounds of fresh plum tomatoes, blanched in boiling water, plunge in cold water and peal under a stream of cold water. Remove seeds. In a large bowl, use your hand to crush tomatoes. Fresh sliced bell peppers or hot peppers rings sauted in olive oil to top the pizza. Directions: In a deep sauce pan, add olive oil and heat to medium heat. Add onions, half the garlic and simmer until onions are translucent. Add tomatoes, salt and pepper to taste. Bring up to a low boil and simmer for about 30-45 minutes. Keep stirring from the center of the pan to prevent burning. When the tomatoes are done, add the fresh parsley, the basil, oregano and remainder of the garlic. Continue to cook for another 3-5 minutes or so. Serve on your favorite pizza crust or enjoy on your favorite pasta. Kathy wrote this article to get us ready for the PA Herb and Garden Festival! We'd love to see you there. Tina will be talking about useful weeds, and both Tina and Maryanne will be giving a workshop (you must pre-register) on healing vinegars. It's a few days early for us to be putting up the new issue, but for the second time in over 14 years, we sold out before we were ready! Get your subscription now! We've got a great early spring issue coming up for you. As the snow drifts my driveway shut (again), we can read and dream and remember that spring will indeed come again. Carey's beautiful cover art depicts the view a gopher might see as the weather turns and blossoms begin to fill the air above her tunnel. Making lemonade from lemons, or movin’ on down. Learn all about this early spring helper. A recipe to cleanse the air. Several great remedies to help put an end to that creepy crawly feeling. This amazing spice has so much to offer us. It can address a great variety of ailments, and it complements so many dishes, too. A little fun with the herb of the year. One of our favorite plants for pollinators here in our garden. Not so long ago, these gardens made the difference between a hard winter, and a terribly hard winter. What are the best ways to help keep this very vital organ… well… vital? Another spectacular and unusual soap recipe from Marci. It’s almost time to spend a few hours on the ground picking violets. Find out why you’ll want to take part in this spring tradition. 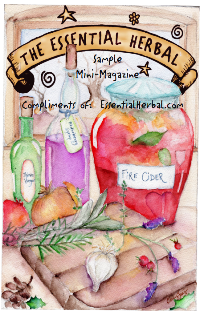 We so often forget how to slow down and relax, but with a few herbal preparations, it can be much easier. 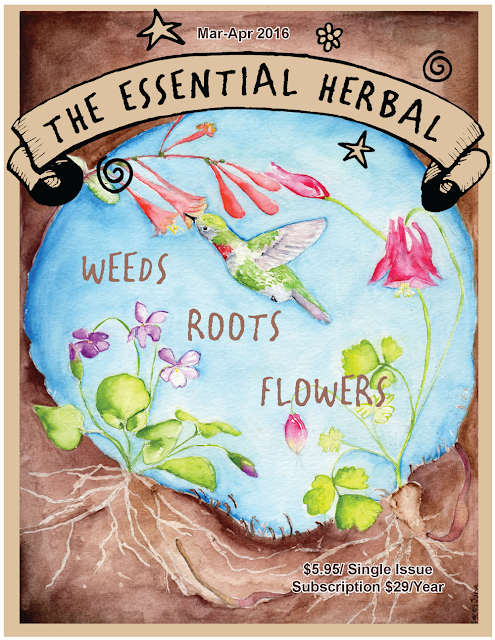 This versatile tender perennial has long been a part of herbal legends. A chart showing tea from harvest to cup, and how it got there. We've got a brand new classroom and we can't wait to get started! If you're local and interested in learning, please consider joining us for one or more of these offerings. We're going to make 2 different goodies in this one. While we make them, we'll talk about the ingredients and how they will help us fight off germs. We'll give some other good ways to stay healthy while we're at it. First up will be a hard candy featuring elderberry, ginger, and lemon. Next we'll be borrowing from Rosemary Gladstar, and making "Immunity Balls" with a nod to her Zoom Balls, but using herbs that help us face the changing seasons with confidence. We'll be at the PA Herb and Garden Faire Friday and Saturday (April 8 and 9)- come see us! Get harsh chemicals off your dressing table. Landis Valley Herb and Garden Faire is May 6th and 7th. We're directly across from the entrance. If you have waterproof boots/shoes, wear them. 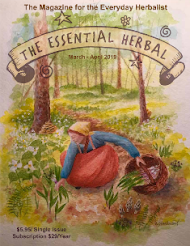 We'll be walking down into the woods and identifying some medicinal herbs, some spring ephemeral flowers, and whatever else crosses our path. 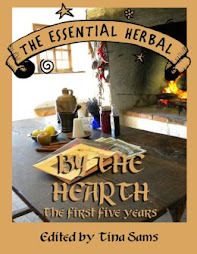 Then we'll return to the workshop where some pre-infused oil (using some of the herbs we've just identified) will be ready for us to strain and turn into a wonderful healing salve. It's hard to say exactly what we'll find and what we'll be eating, but there will be plants to identify and we'll whip some of them up into some interesting dishes. Part of the fun is the anticipation and wondering what we'll find! Since yesterday, I have read hundreds of replies to my post. Some of you brought me to tears. Some of you made me feel like I was part of a very large group. And some of you made me smile in solidarity. A terrific source for articles, book reviews, sources, schools, etc. Lots of good, reliable information. A good scientifically oriented site that sifts through the hype and mumbo-jumbo to give you good, clear data. The Tisserand name has been prominent in aromatherapy since the 70's and Robert Tisserand has been a professional aromatherapist for over 45 years. Good, trustworthy information. As for the books, I will tell you that I am not terribly left-brained and while some of my friends prefer huge professional aromatherapy tomes (and might call some my choices "novels" in a slightly condescending manner), I believe that the general public, the people that I'm talking to... will get what they're looking for by starting with one or more of these books. None of these books set out to CURE anything. They comfort, ease, soothe, and help with symptoms and/or self-limiting illnesses or mental frames of mind and behavioral issues. Marge happens to be a good friend, but I would love this book even if I'd never met her. 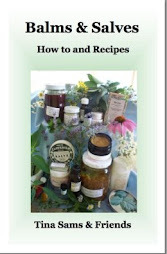 It is beautiful, concise, tells you what you need to know, and then shares some wonderful formulation recipes. For those wanting to make their own products for body care, this book is a blast. Hair, face, massage, and skin are all covered. Tons of recipes and instructions. In fact, Storey has a lot of great books. My sister and I share the library, and these are down at the soap workshop right now, so I don't have the ISBN's. This book is pretty new. I loved reading it even though it is all about copper stills, and mine is glass. Hydrosols are the steam that rises and carries the essential oil away from the plant material, and when it returns to a liquid state, tiny molecules of essential oil are emulsified and suspended in the water. We are generally most familiar with hydrosols in the form of witch hazel or rose water. This is a lovely book. 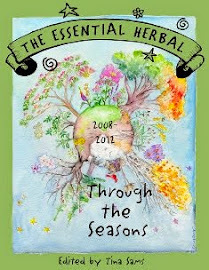 This book covers 65 essential oils, giving description, actions, extraction method, characteristics, and common usage. It goes on to provide a reference section on common complaints, discussion on the art of blending, information on buying, storing, and safe use guidelines. And a whole lot more, especially in relation to massage. If none of these look interesting, try Googling "Essential Oil Book" and you'll find many more. These are just the ones I have handy that have been helpful to me. We decided to start offering witch balls late last year and it has definitely peaked my interest. Here are a few interesting tid bits I found along the way. Putting your witch ball in an East-facing window may ward off detriment. This may be because the sun rises in the East and may welcome new beginnings and the light from the witch ball may scare away detrimental or harmful energy. Witch balls gained popularity in Medieval Europe. Depending on the region holistic practitioners, or witches, would bless them to ward off evil from the home and in other regions witch balls were filled with bright colors to attract a witch. When the witch would touch the ball her power would be captured by the glass strands or web and the community as a whole would be safer. And it’s the witch balls. In Cape Cod fisherman have traditionally tied witch balls to their nets in order to ward off evil spirits that ride the waves of the high seas. During the 18th century many Christians would fill their witch balls with herbs such as costmary and frankincense and myrrh to ward off evil and witchcraft. A witch ball from the 17th century was found in the UK with hair, fingernails, carpenter nails, and for some reason even urine inside. It was opaque and needed to be x-rayed to actually found out what the contents were inside. The reason behind this witch ball was to actually throw the spell back as the witch. The urine was to slow and confuse the flow of the spell while the nails were supposed to get in the way and frustrate the witch. Isn’t that um, detailed?